is integrating with OpenID-based Single Sign-On. This enables Google Apps users to access your application without creating and maintaining additional credentials. This lowers the barrier to entry for your application and creates a seamless on-boarding flow. In addition to making your app easier to use, OpenID can improve security for applications by reducing the number of places you need to enter a password. Of course, it’s also important to strengthen the security of the places you are entering your password, and yesterday’s launch of Two-step verification does just that. Until yesterday, Google Apps customers using Google Apps’ built-in authentication mechanisms needed to provide a username and password (something they knew) to log in. Our launch of 2-factor authentication, which we’re calling Two-step verification, enables users of Premier, Education and Government Editions to additionally require having something in possession- a mobile phone- to log in. So, if you’re a Marketplace developer and your customer asks you if your app supports 2-factor auth, you can answer an emphatic “yes” and send them over to the Marketplace to add your app to their domain. One of the core requirements of preparing an application for launch on the Google Apps Marketplace is integrating with OpenID-based Single Sign-On. 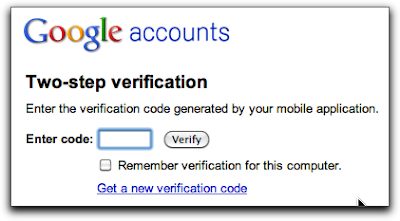 This enables Google Apps users to access your application without creating and maintaining additional credentials. This lowers the barrier to entry for your application and creates a seamless on-boarding flow.